Hey! Contest to promote aimless writers adopting homeless kitties only one day old, and already got winners! Contest not over! More winners next week! Lots winners! Keep sending writer cat photos! Now! Stupid writers! Contest details here! 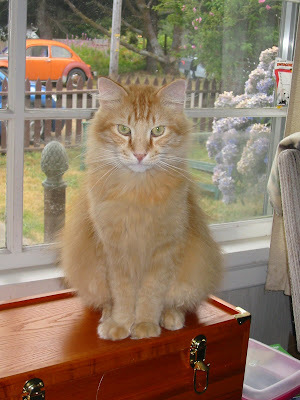 First winner, cats Admiral Dufus and General Nuisance via their writer Janet Freeman-Daily! They win-three reasons! First, first to enter! Not last! Have many entries! But first! Sydney said to hurry! Writer follows instructions! Sydney likes this. Second reason! Good picture! Pretty kitties. Reminds Sydney of her enforcer, Mr. Oz! Pastoral scene of kitties magnetically attracted to shed on black jacket! Ahhhh! Admiral Dufus (13 lbs on my arm) and General Nuisance (15 lbs on my lap) inspire me to stay at my computer and use my left brain. 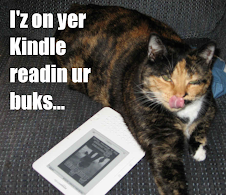 So, smart kitties know writers easy to push around and only use half brain! Good kitties! You got winner stink all over you! Be sure to shed on jacket! Sydney will be back Monday with more or our regular Bad Agent Wisdom, and Tuesday with another winner in our Big Contest! ALL WRITERS NEED CAT SUPERVISION!! If you miss message, go read now. HERE! But many writers already read and they say to me, "Sydney, you are sweet to think of this, but I already have adopted my cat overlords. 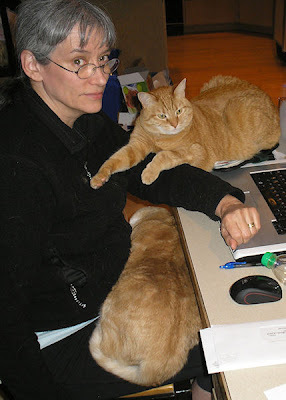 Let me tell you about them..."
This is when Sydney thinks, "writer who has already cat overlords can inspire catless-writers to accept their destiny (say in Darth Vader voice)! So Sydney is launching a new contest! Works like this! You send me email pictures of your cats, or of you and your cats! Tell me names! If you want, tell me short, cute stories of how cat supervision has improved life and/or writing! Email me at sydney@badagent.me! If I like, I run here at Sydney-blog, and you win! Prize? I get treat! (Hey, I am cat, and is MY contest!) Also your cats get treat! You give! (They are cats, and is still MY contest!) So fire up cameras! Send now! Go! 1. ENTERING GIVES SYDNEY T. CAT AND HER AUTHORIZED PEOPLE NON-EXCLUSIVE RIGHT TO USE AS WE SEE FIT. U send, is MINE! Next rule! 2. ONLY WRITERS AND THEIR ADOPTED CATS MAY ENTER. Okay, writers and their dogs, ferrets, mice, fish may enter, but Bad Sydney reserves right to make fun of or possibly eat them. Next rule! 3. PRIZES: Sydney's people will provide her with favorite Greenies treat! Writer must give their cat (dog, ferret, mouse, fish) favorite treat. YOU! Not haft give Greenies. THEIR FAVORITE! YOU KNOW! Stupid writers. Next Rule! 4. DEADLINE: No deadline. Just till Sydney gets tired or bored. HURRY ANYWAY! Stupid writers. Next Rule! 5. NO MORE RULES! Unless Sydney thinks more later. Can do! Stupid writers! GO TAKE PICTURES OF CATS! GO! Writer friends: Sydney is serious this week. She knows sometimes she says one thing, you do other (like herding cats! ), but not this time. I say, you do! But seriously. Looking for funny cat things to share with you, she made mistake of searching for "Cat" on Google news. DO NOT DO! HORROR SHOW! Many cats with no homes on street, many bad peoples to do things to them! THIS CANNOT STAND! Meanwhile, has come to Bad Agent Sydney's attention that many writers going to waste without proper cat supervision! ALL WRITERS NEED CAT SUPERVISION! I repeat: ALL WRITERS NEED CAT SUPERVISION! Somewhere right near you is cats needing good homes and writers to supervise. Go to shelter near you! Many chain pet stores also host adoption centers. Sydney was in Petco just yesterday, see many pretty, nice cats need homes! *Bad Agent Sydney also concedes that there are also many, many dogs in need of good homes too. She admits that while they are too dumb to provide proper writer supervision, they may provide companionship and fetch your slippers, which no dignified cat would EVER do. Sydney Wisdom of the Day: It's only TUNA! 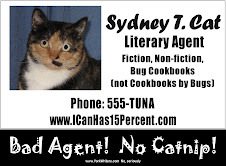 Many writers want to sign with Bad Agent Sydney because "she works for tuna." Stupid writers do no understand tuna = money! You sign contract, I get 15%. Tuna, dollars, quatloos, does not matter. I get 15%! Stupid writers only look at dollar signs. In publishing, for writers, and for me, many things is money! Subrights is money. Royalty terms is money. Time is money. Even reversion-clause is money! Long as stupid writers only look at dollar signs, nobody paying attention to what I do with everything else. Nobody notice that semi-truck just back up to Sydney's office with daily tuna delivery! Writers should treat everything in business like money, but don't. Is good to be me! So don't you worry your pretty little head about it! Are you "prolific" client? Do not like! For agent, submissions = work. Sales = money. This is why, no matter how many things you write, only want to submit things am sure will sell. More money! Less work! Stupid prolific clients want me to submit many things! Some sell. Some I have to submit again! Oh, stop it! Do not try to make this about you! It is always about me! Is good to be center of the universe. PURRR! Have just slept on read your latest manuscript. Good news: it can be fixed! For a small kickback fee, Mr. Oz will sit on go over your manuscript and take care of all your problems. No, Mr. Oz has never sold a book of his own. In fact, he has never written a book. In fact, he cannot spell, and has a fair contempt for human language. But do not worry! His claws are very, very sharp! Hey, I can multitask! You don't mind having a part-time agent, do you? Do not worry your pretty little head about it. Sydney Wisdom of the Day - The "Float"
Do you know why they call it a "book advance?" Easy! It's in my bank account WAY in "advance" of when the writer ever sees it! No, that editor did not like your book. If they'd liked it, I would have sent it to them. No, of course they haven't read it! Weren't you listening? They say, "a little knowledge is a dangerous thing." Fortunately, most of my clients never even bother to get even a little knowledge of what I'm up to with their business! Just the other day, a potential client asked to see my "agent license." My AGENT LICENCE! I told them, "sure! I'll have the tooth fairy, Santa Claus, and an honest politician bring it right over for you!" Putting an agent into the middle of financial transaction like a book deal puts an entirely new layer of confusion, uncertainty, and delay into an industry already rife with confusion, uncertainty, and delay. That certainly leaves me a lot of room to maneuver. Sydney Wisdom of the Day - "For the duration of the contract"
When I handle a contract, it's like when I get stuck hanging from the drapes. Once I get my hooks in, they ain't NEVER coming out!